Clearly, I'm far, far brighter than we ever gave me credit for, people. I have stared down my white whale and have come out on top, with both legs and my ship in tact and no glass eyes and... perhaps I shouldn't reference books I've not yet read. After weeks of trying to sort out this question of "widgets" or "buttons" or perhaps in your culture you say "really cool graphics that seem too stupidly difficult to apply"- you know of what I speak, yes?- I have worked it out. Don't believe me? Cast your gaze to that there sidebar now riddled- riddled I tell you!- with buttons. You cannot stop me, you can only hope to contain me. Not only do I have two buttons on both my KALs- admittedly created by Ann, Ami, and Lana- but, should you click on said buttons, you will be instantly and magically transported to that KAL's website. Again I say HAHAHAHAHHAHAHAAAAAAAAAAAAAAAAAAAAAAAAAAAAAA. And for any of you out there who aren't too web-savvy, I'll let you in on a little secret: I am the first person in the history of Blogger to attempt and succeed at this difficult and dangerous bit of computer sorcery. Really. I am. First one ever. If anyone tells you differently they are one hundred percent lying and frankly I question why you're hanging around such unscrupulous characters in the first place. First buttons ever, folks. If anyone out there is interested in a Read-a-Long KAL to Mists of Avalon or the Harry Potter series, please do contact me at knitter.natter@yahoo.com. Address all emails to "Your Wisest, Cleverest, Most Brilliant Widget-Conquering Majesty who might easily pass for an American Kate Winslet." So... not much else going on. Oh, did I show you these? Those are my "Sweet Tarts" socks, yarn dyed and freely given (we royalty get lots of freebies; we also get the right to refer to ourselves in the plural as in "God and I, though perhaps we should reverse that order because who was it that just added those buttons? That's what I thought.") from Brooke, who will probably be sending me lots more yarn now that she realizes how genius I am. Still, give Brooke a hand. She chose the color schemes and dyed the yarn and it's just so bright and eye-catching and brilliant. Otherwise we're expecting it to be a great day here, one that will probably involve me falling down in front of a large group of people. This high horse is none too steady. Finally, Martin Scorsese has his. YES! See The Departed if you haven't! Best Director! YES! because Alan Arkin just won the Oscar for Litttle Miss Sunshine. Whoo-hoo! The French Market tote from Knitty pre-felting. The French Tote from Knitty post felting. It's too weirdly hot here to write anymore. I don't know what's going on, but we've gone from chilly temperatures and brisk winds to mild, sunny days in the high sixties. Earlier this evening I called for our manservant to bring me a strawberry daiquiri to celebrate the onset of early spring. Until The Hubba reminded me we have no manservant. Or daiquiri mix. Or rum for that matter. So I'm drinking buckets of water instead and am probably not all that fun to be around. Will post more soon, probably in a bathing suit if this weather keeps up. On an up note, I'll leave you with a funny question from Trivia Pursuit (The Ninties version) regarding screwy weather. Who did more than one hundred Californians call to complain about the weird weather being reported all over the news? Al Nino. It's be funnier if you had a strawberry daiquiri. In an oddly Martha Moment I decided to do cupcakes for Valentine's Day, some for The Hubba to take to work and some for me to take to the shop. they were not so much pink cupcakes as cupcakes with a bad sunburn. The one time in my life, I'm not going for a Big Orange effect...well, you can see for yourself. Luckily, in baked goods, unlike in knitting, even if the look isn't exactly what you hoped, as long as the construction is correct, the effect is the same. Marc Jacobs ain't got nothin' on me. And did he hand-sew the lining into his bags? Thanks to Knitty Yoda and her unbelievable stash of fabric (seriously, y'all haven't seen a stash until you've seen Knitty Yoda's piles of fabric), I have an entirely finished project to report. The cabled bag, started right before Christmas, finished in body around the end of January, finally has all its pieces-parts in place and is an official accessory. One hundred percent done. As soon I figure out where the buttonholes went. I didn't loose them exactly; this being my first time with buttons, I assumed it would be easy to see the hole where I cast-off (British pattern, you know, got to use the pattern lingo). Turns out, not so easy. After a little sleuthing, Yoda and I thought we found at least two of the three. Mind you, I think I just sewed a lining over the two that we found. Did I mention the open-faced, button-free bag is in again? Speaking of buttons, I've wanted to hold off on mentioning the Harry Potter KAL sweeping the blog world until I worked out a button. Unforunately, well, that's not happened. So as a pre-launch to the real launch which will definitely include a widget, I'll just mention if you click here, you'll see the start of the website Knitty Yoda and I are co-hosting. Of course, I'm knitting something in honor of Book Seven; what kind of fan do you think I am?! I cast-on again on one size larger needles. I knit loosely. I'm all the way through the heel. It still won't pull up over my foot. It has no stretch. But it's pretty! But it doesn't fit. But the pattern is easy! But it doesn't fit. But I'm through the heel! But it doesn't fit. These are the insane thoughts going through my head. As though the attractiveness, simplicity, and nearness to completion of the single sock will magically overcompensate for its teeny-tiny size. Display sock? Not even I could be so delusional to knit one- or worse, to have a matching set, two!- entire sock(s) that has(have) no hope of fitting me or anyone else I know- could I? I'm putting it aside for now. I've got the Easter Bunny and the Tooth Fairy coming over to help me pick out a new sock pattern. If you missed this- and how could you have done that?- THE COLTS WON! 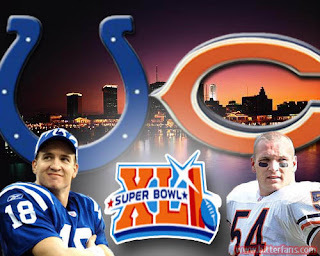 In what was a GRRREAT Superbowl the Indianapolis Colts won 29-17 against the Chicago Bears. Mind you, next year I think the Bears will be even more terrifyingly good, but for now- the Colts are OUR Superbowl champions. And they came home to Indianapolis yesterday and at night in weather that felt like seven degrees had a parade. I love my COLTS! The Hubba was brilliant. I can't say how I would have behaved, but I'm sure I wouldn't have been anywhere near as good spirited and generous about the outcome as he has been. But back to the world of knitting! Remember the sock I showed you, in Brooke's fabo yarn? couldn't get them down my foot and promptly frogged 'em. HEY- before I get any barely-concealed knitter-smug "did you swatch?" let me say "YES, I SWATCHED." Honestly. I even did a full swatch of 4 inches, when I might have been inclined to only do half that. And, on size 0 DPNs, one size smaller than the pattern called for, I got gauge. As the pattern required, I swatched twenty-four stitches for forty rows=four inches in stockinette stitch. However. With this pattern and its "stranded stitch" I think I would have done better to, as the Yarn Harlot recommends, swatch in pattern. The pattern is not especially stretchy and with the stranded stitch I think the sock is even more tightly knit- sort of a backwards Fair Isle. Point to say, I started over, on size 1 DPNs. If we hadn't had Jack Bauer in Season 3 to watch at the time I'm not sure what I would have done. But, somehow, frogging my socks paled in comparison to going rogue, busting a known drug-lord out of prison, sneaking said drug-lord back into Mexico, and nearly having to kill his own partner. Just a regular hour in the life of a bad man. A close game. This should be exciting the most exciting Superbowl in ten years- or at least so says The Hubba and so it is law. Or something. A good clean game. With these two teams head coaches, I expect total class from both sides of the field (and both sides of the Knitter home). Good calls by the ref; mainly, I hope they stay out of the way. A touchdown for Marvin Harrison. And- second only to wanting a touchdown for Marvin- the game. To. Get. Here. Socks, Colts and Bears- Oh My! The lace socks are finished! I must admit, I don't really care for the disembodied look of lower legs and socks; you see it all over knit blogs and I find it creepy. Still, it shows hand-knit socks in action, so I give you I Know What Your Socks Did Last Summer. The bag (pictures not included) has all pieces made (some assembly required). It seemed the perfect time to start two new projects! The free yarn from Brooke came in this gorgeous colorway called Sweet Tarts. I've picked Crusoe from Knitty and while I'm really enjoying the pattern, the stranded stitch isn't showing up brilliantly. So I might be pulling out the ole' stand-by Sensational Knitted Socks for a different pattern (Did I not mention that? I got SKS AND Knitting Vintage Socks with the Christmas gift certificate Pops and Suz Knitter gave us- thanks, guys! A knitter's bestfriend- free pattern book money on Amazon!). So if the stranding doesn't start to pop, then it's good-bye Crusoe (for a later date), hello SKS! I also picked up the yarn for the French Market bag to cast-on this weekend. Again with this sudden purple fixation. So there will be knitting this weekend. And... what else... what else? Oh! That's right. THE COLTS ARE IN THE SUPERBOWL! I've been hesitant to mention this for fear I'd brag about it, wake up and discover not only were the Patriots in the Superbowl, but they didn't even have to play another team, just stand around and wave while sports reporters bowed at their feet. THE BEARS ARE IN THE SUPERBOWL! That's all I can say about it right now. I'll post tomorrow (how could I not?) but for the moment I'll leave it at, I'm still a Colt (no matter how many of The Hubba's- clearly stupid- friends think I should come over to the side of the Bears because it's his team) and he's still a Bear and we're still on friendly terms, and tonight (in a spirit of camaraderie and good will I'm sure) we'll hammer out The Rules to the watching of the game, and, oh by the way, Georgie says "hi." J.K. announced a release date. 1. Knitty Yoda and I were just talking about this yesterday. Honestly. This time yesterday morning we were having this very discussion- when will it be released?- and she suggested maybe, oh please, oh please, if we cross our fingers and toes, the new book would come out this year. I said, maybe, but absolutely, with no doubt, definitely not July this year. 2. Because back when HBP came out, fans predicted the last book would be released this July, the seventh month in the 2007th year, on, perhaps, the seventh day. They were only a little off. I was certain they were wrong. 3. The Hubba, hopeful for me, suggested,way back when we saw GoF they would release the last book in the same month they released the film version of OotP. I laughed in his face. Huh. So much for intuitive powers. BUT WHO CARES? We have a date. So Barkley and I have spent this snowy morning dancing around the house to DMB's version of Sweet Caroline. Dave, in his best Neil Diamond gravelly voice: "Sweet Caroline/The good times never seemed so good" [fans] "So good! So good! So good!"